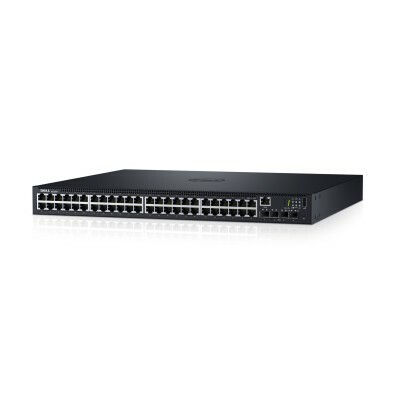 The N1500 switch series offers a power-efficient Gigabit Ethernet (GbE) network-access switching solution with integrated 10GbE uplinks. The N1500 switch series has high-performance capabilities and wire-speed performance, utilizing a non-blocking architecture to handle unexpected traffic loads easily. These switches offer simple management and scalability via a 40Gbps (full-duplex) high-availability stacking architecture that allows management of up to four switches from a single IP address. Deliver clean power to network devices with PoE+ support. The Dell Networking N1500 Series has options for up to 48 Power-over-Ethernet Plus (PoE+) ports. You can attach devices with high power requirements (up to 30.8 watts) without running a separate power cable. PoE+ is particularly useful in older buildings where installing power to multiple, widespread locations can be prohibitively expensive. Dell Financial Services provide a wide range of contracting options that make technology acquisition easy and affordable. To learn how financing can help you maximize ROI and lower TCO, contact your Dell account manager or DFS representative.